Were you sitting in the oak tree last night? eyes, long legs folded, yet ready for flight. Where did my long legged heron boy go? and beckon you to follow her along? now stretching to embrace eternity? With unclipped wings, fly away without fear. I did not hold you close to hold you here. snow cones slurped, and smiles. Our grandchildren have Uncle Patchy. Our kids have Uncle Dave. And we had Uncle Bob. Uncle Bob didn't go to college, never married, and never had what would be considered a successful job. He spent a few years working for the Civilian Conservation Corps and he lived in California for a short time, but by the time I was young and knew him, he was living with my grandmother. He had odd jobs throughout his life, gas station attendant, liquor store clerk, and janitor at Northeastern Junior College. By the normal standards of our society, he wasn't very successful. To his nieces and nephews, however, he was the favorite Uncle and could do anything. Both my brother, Uncle Dave, and our son, Uncle Patchy, have successes in many aspects of their lives, none of which matters to their nieces and nephews. Their uncles make them smile and laugh. 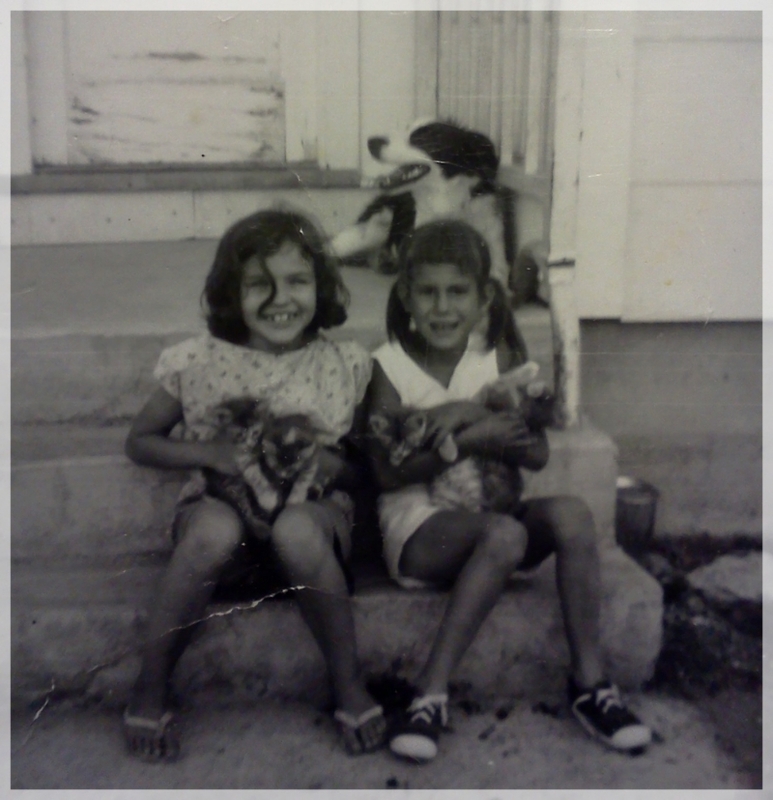 Me and my cousin, Karen, holding kittens. Duke is in the back, sitting on the porch. This is the photo that belongs with the story of my aunt Maribelle. Click on the photo if you'd like to read it again. Mud pies in the sun made with little hands and spiced with roly polies.